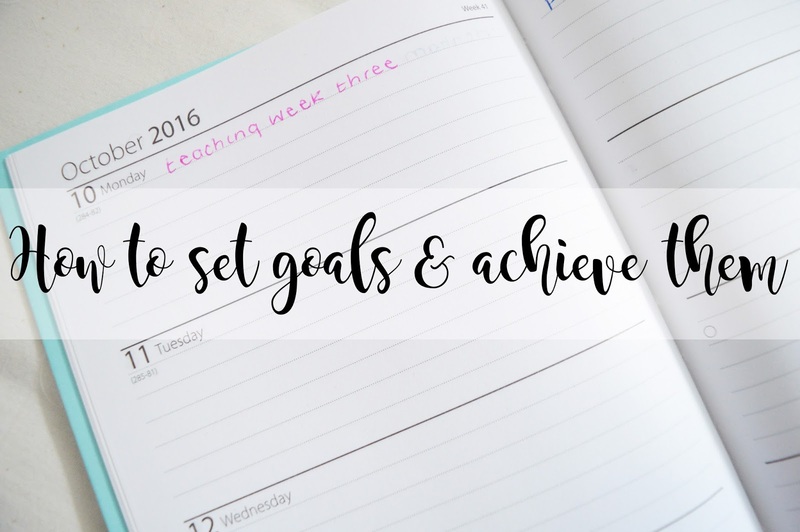 I believe setting goals is very important in general life, as well as being a student and even a blogger too. As a student, I am always trying to improve in every aspect I possibly can and setting goals is the best way to do this. Also, I like to set myself goals throughout the day, so I know I'm able to get different bits and bobs done through each day. As a blogger, I never used to set myself goals, however now my blog is growing very rapidly, setting goals is a very exciting thing to do and when I reach each goal, my little bubble of happiness grows and grows. Setting goals is one of them things which will boost your own self-confidence, but it will also boost the satisfaction in the long run once you have completed different tasks. We all know good satisfaction makes us happy, right? Below are my tips on how to set goals and achieve them! You need to choose your goals wisely. Is the goal you're currently setting relevant to you? Is it realistic? Does it have any value to you? You need to care about the goal which you're setting otherwise you are simply never going to achieve it. You need to be able to have motivation to complete this goal and know that the outcome will bring you some sort of benefits or satisfaction. This is something I definitely never used to do and I'm so glad I realised that it's the best thing to do. When you have a large goal that you need to complete over a period of time, the best thing to do is to take little steps. Do a little bit each day and you'll get there eventually. If you try and achieve the goal in one day when you know it will take more than one day, the outcome will most likely, probably be negative and this won't bring you any happiness or satisfaction. One thing which helps you to achieve your goals is checking back in at previous goals. Look back at them and see how far you've come. By seeing what you have achieved so far, will push you to carry on achieving and this is so important as a blogger, student and someone who is generally finding life quite difficult or stressful. Look back at how far you've come. Did you ace that 3000 word essay last semester? Did you reach your next goal of followers? Have you beaten your depression? Don't let what's going on now, to stop you from achieving your goals. You can do this. Don't get disheartened when you fail at something, this is completely normal and it's fine! Being able to learn from failures can be such a difficult thing to do but it makes you such a strong person. What could you do differently for next time? What plans have you put in place to make sure you improve? Mistakes are proof that you are trying and this is the best thing you could ever do. I found personally that writing my goals down is the best way for me to have clear visions of where I'm going next. However being accountable in any possible way is a winner. So tell someone what your goals are so they can motivate you and push you to achieve. Write it down where you know you can look back at it and see how far you've come. Make clear visions of where you want to be, and how you are going to get there. You can do this, as long as you believe. I would love to know if this has helped anyone out there who struggles when it comes to setting goals and not achieving them.